Abzû, the debut game from game development house Giant Squid, may as well have the subtitle Journey 2 or maybe even Flower 3. Studio founder Matt Nava, the former thatgamecompany art director of those aforementioned art house gaming touchstones, is making yet another emotionally bald, deeply pretty game about communing with nature through fluid controls here. In playing Abzû, though, any cynicism born out of its similarity to Nava's past work floats away like so much foam on a wave. This undersea adventure is immediately familiar, clearly of a piece with Journey's nomadic wandering and Flower's breezy environmentalism. Even in just a brief demo session, though, Abzû is equally transcendent. 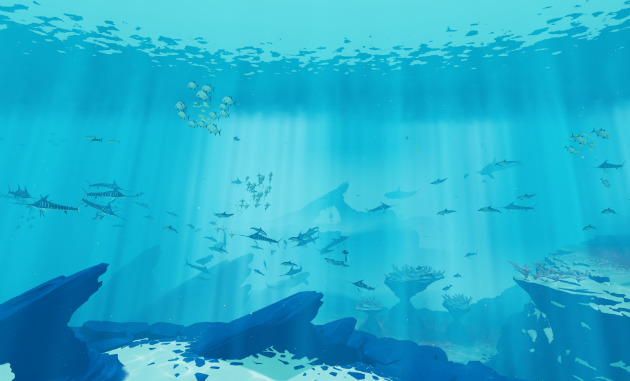 Of all the games from E3 2015 I got to play at early events, Abzû is the one I didn't want to stop playing. Even in a pre-alpha state, Giant Squid's game makes you feel like you're somewhere else. Rather than Journey's desert or Flower's verdant pastures, Abzû drops you into the middle of the ocean as a young woman sporting a black-and-yellow wetsuit as well as some miraculous scuba gear. During a brief introduction at a pre-E3 event, Nava explained that he and his team want your time as a submariner to be totally uninterrupted by onscreen displays or a pressing need to fill up on oxygen. Abzû's heroine can stay underwater indefinitely, peering into submerged caves and kelp fields as she moves forward. Rather than break the illusion of exploring the ocean floor, the unreality of your scuba gear is freeing, letting you come to terms with the diver's initially tricky, but ultimately silky swimming controls. What Abzû lacks in terms of technological realism, it makes up for with ichthyology accuracy. The elegant icy caverns and sun-dappled reefs you swim through are heavily populated, with what Nava describes as "tens of thousands" of fish. Not only are they modeled to look like their real-world selves, but also they behave like actual fish, flowing in tight schools. The effect of swimming smoothly into an open, shallow area after sneaking through a cave only to find it teeming with fish ranging from teensy to enormous is mesmerizing. The fish can also lead you farther into the sea you're exploring. Holding the PlayStation 4 controller's trigger -- the pre-alpha build on hand was running on Sony's machines -- the diver automatically schools with whatever creature's closest. In a large horde of silvery fish, she'll merge into the center and follow along as they loop and pirouette in the current. When I caught up with a sea turtle lackadaisically tooling around a giant rock, the schooling button made the diver do a little flip before she lightly clung to the amphibian's shell. While I didn't catch up to any in the demo, Nava told me that I could even meet up with whale pods later on. The effect of swimming smoothly into an open, shallow area after sneaking through a cave only to find it teeming with fish ranging from teensy to enormous is mesmerizing. Schooling with the fish is an odd gaming reward. More often than not, video games reward action with more action. Shoot a red drum; it explodes. Complete a row of Tetris blocks; the blocks disappear and a bright noise sounds. 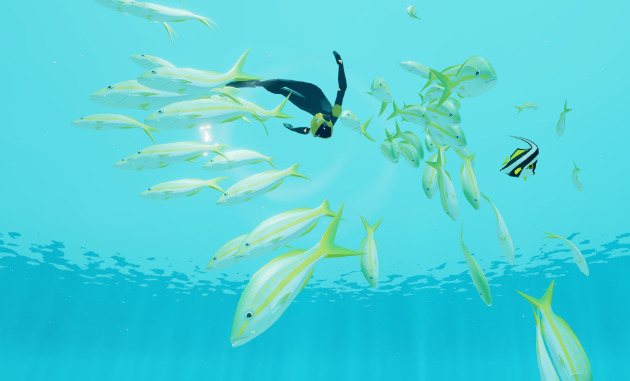 In Abzû, merging with a school following its movements is a passive act, but deeply affecting. You give yourself over to the simulation of nature and seeing your almost abstract, minimally detailed diver merge with the hyper-detailed fish elicits a catharsis startlingly similar to actually exploring the natural world. Like all moving art, it exaggerates and imitates the real world to evoke something fundamental. Sitting in the basement of a hotel surrounded by humming computers, I couldn't help but get swept away by Abzû. It's not all reenacting the final scene of Tom Hanks blissfully swimming off with Daryl Hannah in Splash in Giant Squid's game; there is a steady sweep forward. Unfolding in a similarly linear fashion to Journey, the demo did indeed have goals, even if they were simplistic. In exploring the caves, I ran into passages blocked by sand or frigid water that I couldn't get past. While a solution to the cold wasn't on hand in this version, there was an answer to the sand. Periodically you'll find small, yellow submersible drones that can be reactivated. After the shark messed up my drone, the demo took control of the diver as well. She swam out and out into the open sea as the camera pulled back revealing an even wider swath of creatures than I'd seen to that point. Manta rays, whales, giant schools of luminescent fish in a panoply of colors. 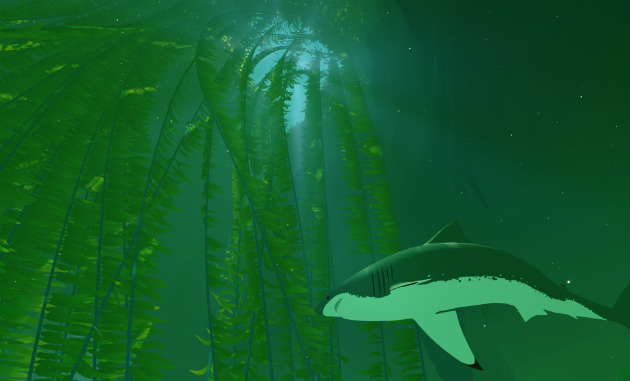 While Abzû won't be released until 2016, its fundamentals are already well in place. Nava has made yet another game about peaceful exploration and observation that conjures up intense emotion. Whether it feels as complete as Journey and Flower will depend entirely on how it comes together over the next year. With this demo, though, his studio has produced something that made me all too reluctant to get out of the water.